While preparing to leave Kathmandu, I am reflecting upon the amazing time here and the beautiful people I have met and the amazing memories I have created. We were brought together through crisis, the need to leave after devastation and the calling that some of us feel to help, to give guidance, to inspire. Creativeness Fest Nepal 2016. The spirit of Nepal is expansive, excited and heart-warming. I have been welcomed with open arms into poor schools and modest soil-packed homes. I have been blessed by elders, children and living goddesses, bathed in sound and enveloped by local spices. 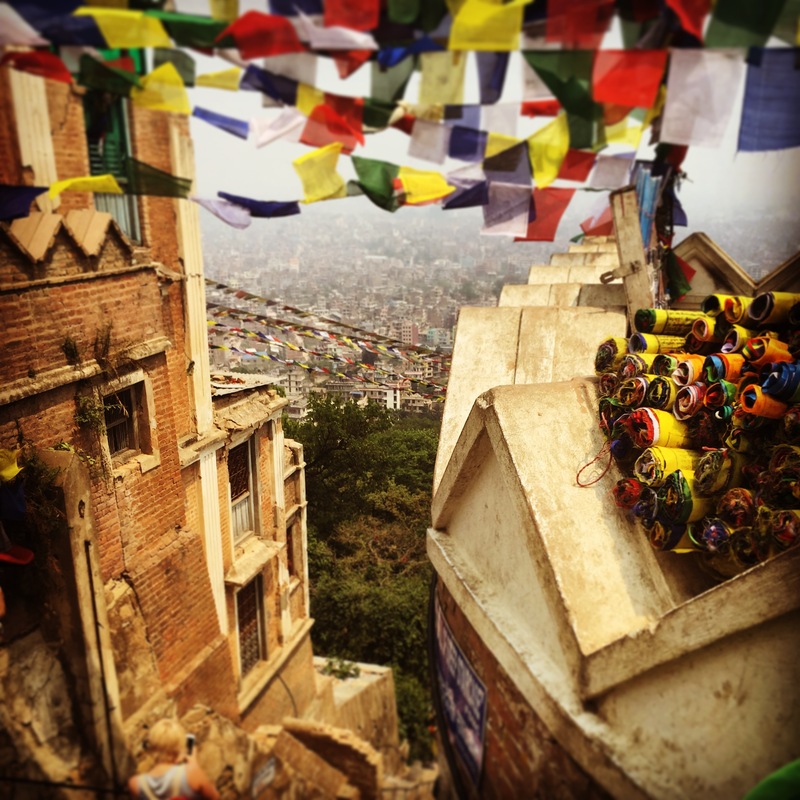 I have haggled for pashminas, encircled Buddhist Stupas, and chased & fled from holy monkeys. I have hugged babies, grandmothers, and the holy Sadhus. And while I have craved clean water, smooth roads and soft beds, I wouldn’t change anything. The packed car bounding over the riverbed…the Buddhist chants to commemorate the earthquake…the sleepless jet-lagged nights…the rickshaw test-drive…the 2am city-tour given my new friend, Mad Max…the heavy-metal fan-boys’ dust storm at a concert in city-center…street cows…and the people! The amazing Nepalese with their glowing smiles and open arms! I have been welcomed here in this frenetic dream of a country, and I leave a piece of my heart, my art and my dreams of intuitive human connection here. Thank you Nepal! I will see you again! Tagged creativeness festival, cultural differences, eastern world, global citizen, kathmandu, nepal, speaking, tavel, workshops, world citizen, world traveler. An excellent experience for trust and community building as well working as a group. It is super easy and accessible even if you have no dance or theater background. I always enjoy breaking out of my shell. Thanks for some new tools to use for play and performance! Jade is like a pure shining diamond. She opens people up petal by petal , like a rose bud about to bloom. I love the fact she is so humble and yet touches so many by being her self. Jade’s ability to relate to the young artist and enhance their artistic ability was profound. Her energy, attitude, and belief in the MyARTS program was truly a blessing. Jade has an uncanny ability to not only organize the logistics of a production, but has the keen know how to make key creative decisions. She is a true mistress of magic. Copyright © 2018 – Jade Osborne. All Rights Reserved.